The functionality LiveCode provides us with to import a snapshot of an object has some extremely useful applications. LiveCode gives us the ability for this snapshot to include grahical effects such as blending, shadows, and color overlays. This lesson will demonstrate how to import a snapshot from an object which has graphical effects applied to it. First we will need to set up a stack. Our stack will consist of two cards - the first will contain the object from which the snapshot is to be taken, and two buttons to take the snapshot itself. 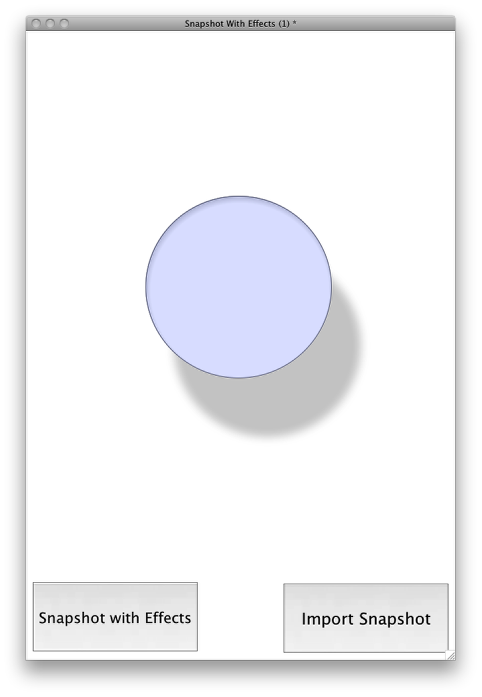 The second card will be for displaying the end result of the snapshot. Now that we have a stack ready, we can apply code to the buttons 'import snapshot' and 'snapshot with fx'. Here is what the code should look like for the 'snapshot with effects' button - an explanation follows. The purpose of this code is to import a snapshot, and copy it to our snapshot viewing image on the second card so that we can look at it, then clean up by deleting the snapshot image (this is not necessary, but is good practice to prevent multiple snapshot images cluttering up our card). When the snapshot is taken, an image is created to contain it. We can refer to this image conveniently as 'the last image'. The two lines after the aforementioned line of code therefore set the dimensions of our 'displaysnapshot' image to the dimensions of the snapshot - thus ensuring that it is large enough to fit the contents of the snapshot image. The following line uses the 'text' keyword to refer directly to the data of each image, and copies the contents of the snapshot to our 'displaysnapshot' image using it. The next two lines delete the snapshot image and go to our second card, on which we can view the 'displaysnapshot' image to see the results. We can see the difference that the 'with effects' instruction makes to the snapshot of the test graphic I used in this app. This graphic includes a drop shadow, colour overlay, blending, and an inner shadow. 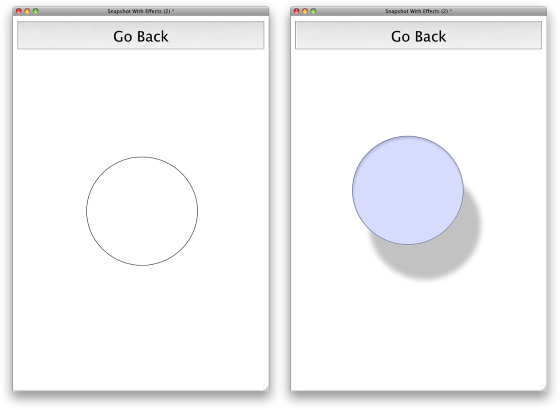 Simply importing the snapshot ignores these and produces a blank white circle graphic. Importing with effects produces an image which is identical in appearance to the graphic. Prev: How do you embed an image in a stack so a path reference is not needed? Next: How do you display an image by dragging it on to a stack? I just did a quick test and screenshots appear to work, could you post an example of what you are doing and let us know what OS you are on so we can look into this further.